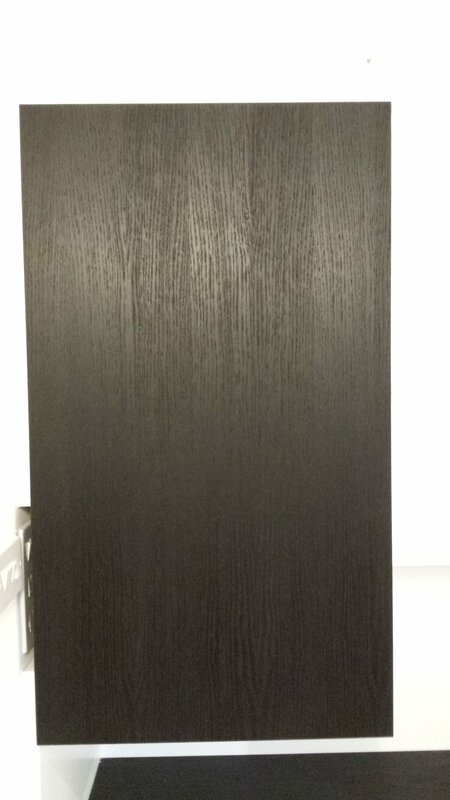 We installed our ebonised Oak project earlier this month. Here are a few images of the finished thing. This was an interesting project with a demanding brief. The clients wanted a bookcase with a low console unit but also wanted to use the furniture to hide an unsightly fuse board, high up on the left-hand wall of the alcove. They also wanted to include a cabinet to house a large wine cooler. It was not an easy task to marry these varying demands within a single piece of furniture. Integrating the large cabinet required for the cooler into the design without it looking shoe-horned in was particularly tricky. The solution was to embrace the cooler cabinet rather than trying to conceal it. The proportions were mirrored in the design onto the fuse-board cabinet on the other wall, the bookcase suspended high up and the console unit tucked into the bottom left-hand corner with space above it for a lamp. The resulting design was a dynamic spiral made up of the four disparate elements. The ebonised Oak was used together with Frigate grey and white sprayed lacquers to produce a restrained, monotone palett. Two slender bookcases were made for the opposite wall to house more books. To harmonise with the asymmetry of the main piece, one was produced with a base cabinet and the other without. The base unit of the companion bookcase was given an ebonised solid Oak top to visually connect these companion pieces to the console unit of the main piece. MILKWOOD. BESPOKE FURNITURE HANDMADE AT THE OLD DAIRY.